There were 703 press releases posted in the last 24 hours and 153,595 in the last 365 days. 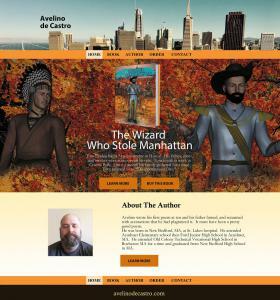 MASSACHUSETTS, UNITED STATES OF AMERICA, November 10, 2018 /EINPresswire.com/ -- The book entitled The Wizard Who Stole Manhattan authored by Avelino de Castro introduces the character of Tom Linden, who in many ways had gone against the norms instilled by his family, especially his parents who are acute overachievers. Described in a fictitious approach, Tom’s life changes forever as he helps a tribe that magically appeared and asked for his help to save Manhattan from a wicked sorcerer named Peter Minuit. The author has endeavored through the years to offer first-rate details about his book. Now the title reaches another milestone as it is now on social media. The readers can now be entertained through the book’s exclusive Facebook Fan Page account. Queries can now be easily raised and addressed.